My world is slowly shifting in a way that I didn’t see coming. It’s been slow and steadily changing. Of course my first reactions were to secure and double check the fortress I build surrounding myself. Just to make sure that I’m safe within. But as I plan to fall in love with myself this year, I decided to take that leap of faith and opened up a window. Yes, still a window…but it was enough for now as I got to look outside the thick cold walls. What I see makes me smile, makes me laugh, makes me forget that I suppose to ‘toughen it up’ for a little while. Then I began to share my stories. My pain, my battles, my demons. Stories untold just flow out like a broken dam, they were unfiltered, overflowing. It was raw and honest and as real as the tears shed behind every words. These bricks are starting to crumble on its own. Yes, it scares the hell out of me but the breeze of fresh air brushing up caressing my face and my soul feels so good after all these times. The warmth of the sun kissing my skin feels so right. For once I can shed my mask and be who I really am. It’s like we are painting. We picked what colors to chose. Patience will be required as we put different colors, different strokes, different shapes on the empty new blank canvas. And when the time comes, we could take a few steps back to marvel at how painting with faith can morph into something beautiful. So, I’m going to paint…painting with faith. 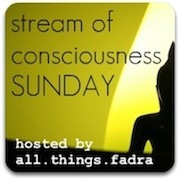 This is my Stream of Consciousnesses with the awesome All.Things.Fadra. Previous Post Walk At Your Own Risk! You what it sounds like, my friend? Healing. I hope it’s only the beginning for you. I’m so glad I didn’t miss this post. You’re so sweet thank you for stopping by. I’m new to your blog, but love what I found here. So glad you posted so I could find you. I hope you figure out what you need to figure out. It sounds like you are well on your way. Happy to be here and meeting you. You have a poetic quality to your writing that I love. I fully support your efforts to paint with faith! This post was uplifting – good for you! “Painting with faith” is the best way to put it. I’m glad you’re strong enough to share your enlightenment with the rest of the world. Thanks Nami 🙂 It’s a start of something and I’m going with the flow for now and trying to trust myself that I am doing what I want to. Very beautifully written, lovely to read. Thank you for sharing. This was truly moving. I am inspired to see the healing that you have already accomplished, and so glad that I stumbled across your blog this week. Thank you for sharing, it gives me faith that my own journey can be as successful. Hi Ashlee, thank you so much for your kind words. It hasn’t been easy but it’s a process that’s for sure. I wish you nothing but the best in your own journey. What a beautiful piece. So pleased to have found my way here via Fadra’s SOC Sunday. There is great dignity, and loveliness in new beginnings. Letting in the light is the first delicious step – I send my wishes that much happiness follows what has already begun. Be well, and seek the sun always. Beautiful. I wish you luck on your journey. This made me catch my breath. STUNNING words. Thank you. Simply and wonderfully beautiful. I love that you are falling in love with yourself this year. So inspiring. This? stole my breath away. Tear those bricks down and let the sun in…see the beauty…feel it right down into your soul. Your journey is so inspiring. This is beautiful, Maureen. I love the images you’ve created here. Painting with faith. Just lovely. Hi Maureen, this is such a poignant post and so beautifully written it took my breathe away. I’m touched by the honesty and openness that oozes from your writing and I’m so happy that you’re moving on with faith and strength. I believe everything will turn out beautifully in its time. I am reading this over and over again. I love how you experience truth as a fresh breeze and the warmth of a sun’s kiss. Beautiful and honest. I wish you the best of everything this year of falling in love with yourself. It’s amazing what Faith will do when we surrender to it. Good luck on your journey! It sounds to me like you’re doing a great job. Keep “painting”! well you know i simply adore you so you should have no trouble falling in love with you. i’m so happy to see you in this place. i knew you’d get through it. i know it’s a struggle everyday, but you’re a wonderful woman and will make it!